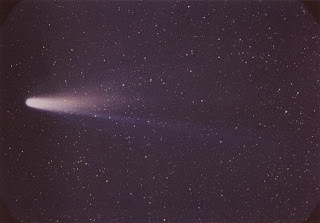 Here's something from 2003 that is a bit interesting - it's an image of Halley's Comet taken that year, at a distance of 28 AU (Neptune is at 30 AU for comparison). Though Halley's Comet is still moving outward and will eventually be 2.5 times fainter than even that when it reaches 35 AU, imaging the comet will still be possible at that distance, effectively making it visible to us 100% of the time. What does this have to do with other solar systems? Well, we are now able to observe Halley's Comet at any position now thanks to more powerful telescopes, while at the same time rocket technology hasn't really advanced all that much during that period other than beginning to use ion drives and first tests of VASIMR. Even at a tenth of the speed of light a journey to even the closest solar system to ours (Alpha Centauri) would take nearly 50 years, and during that time it's very likely that observational technology would develop to the point that we would be able to observe the system in greater detail than even the craft on its way there. That in a nutshell is the problem with missions with durations that extend into decades. In fact, it's even possible that a mission sent to a destination like that could be surpassed by another later mission if there happens to be a technological breakthrough. It would be a bit like setting out on a journey to walk from the tip of Alaska to the bottom of South America, and then a year later be surpassed by a friend of yours from home that learned how to invent a bicycle. Clearly, without the ability to reach other solar systems within a similar length of time it takes to conduct a mission now (that means probably no more than 25 years) it won't be worth it to send missions there. This is actually quite a good thing though, since observatories can be constructed by even some of the poorest of nations, so it's not only a field that is rapidly developing, but also one that isn't limited to nations with the ability to launch their own craft into space. It would be nice to see some sort of international initiative of nations at a mid-level of development (or just small) that would work on something like this (pooling funds to construct observatories for example). Nations like Bangladesh, Ghana, Mauritius, Azerbaijan, Ukraine etc. are a few off the top of my head.